Updated, further improved, featuring a new wet clutch system our 200cc Petrol Go-Kart is brilliant fun. This unique machine is for experienced drivers whom will use the kart in it's higher rev range. Power slides, wheel spins and top speeds in excess of 30mph can be achieved. .This is a DRIFT kart for drifting.Simplistic strong design, our 200cc Go Kart has a Honda design overhead cam petrol engine, fully auto clutch, single independent rear disk brake, front crash bar, roll over hoops, aluminium checker plate floor pan, rear suspension, rear engine protection bar, fully rose jointed steering, chain drive and padded driver's seat. The F1 pilot style steering wheel has the brake and throttle mounted to the sides, and the pull start very easy to use, exactly like a mower pull starter.Just to add to the excitement, the drift go kart is now available with either off-road or on-road tyres. Simply select the tyre you desire using the drop down menu. OLDER MODEL SAMPE OF FUN FUN FUN FUN !!!!!!!!!! new design wet clutch system. he SUPER FUN, and SUPER DUPER, the Muckandfun FUN KART has arrived ..
Powered by a 79.5cc 4 stroke, single cylinder petrol motor this latest product from MuckandFun is ideal for kids aged 8+. Younger drivers at parent's discretion. The Fun BUGGY Fun Kart is fun, safe, MIRA tested and CE approved! Everyone in the UK knows the Kazuma brand and now there is a new member of the family. One thing to remember about all Kazuma bikes and karts is they all come pre built ready to use. What's more, we are the largest spares stockist in the Ireland. Check out the Maxx Drift from all Kazuma Dealers throughout this year. This is the 2015 Maxx Drift Gokart, stronger axle, stronger frame, rear hydraulic brake with great build quality. The uprated Honda clone 6.5 HP engine delivers great low down torque with a great low down price! Just for our customers we fit an uprated carburettor for extra power which is available on tap where customers choose to operate the machine without any restriction. Welcome to the up graded Maxx Drift 200cc Gokart. The previous 160cc model has evolved and grown into a new 200cc version with stronger engine mounts and improved suspension. The larger engine delivers 6.5hp and is a 4-stroke air cooled replica of the proven 168FA Honda engine; one of the most reliable engines that we have ever had the pleasure of selling! 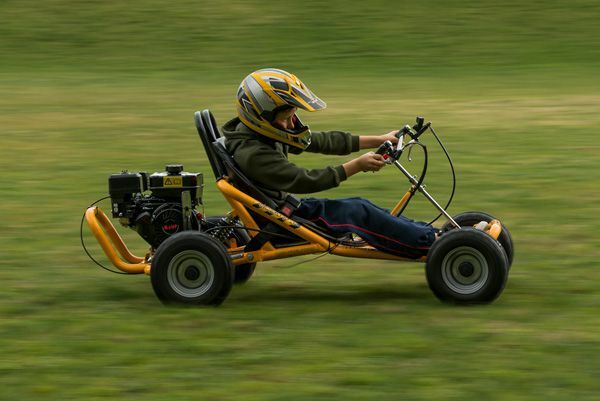 With its amazing off-the-mark speed and high torque, this go kart will have both junior and adult riders revelling in its performance. Just as important as the quality of the engine is the quality of the chassis itself. The Maxx Drift delivers again with a simple strong seam welded frame, which, as well as being tough, makes the kart nice and easy to maintain as there's little that to go wrong! The Maxx Drift certainly has that sporty feel about it. The rear number board, rear disc brake and padded seat keep the kart looking the part, while the F1 style steering wheel provides that F1 feel and extra control for the user. All of the Maxx Drift riding controls are located on the F1 wheel and the metal lever-style throttle is definitely an added benefit. But the Maxx Drift is not just quick around the track - it is also safe. The low seat height (just 30cm) not only decreases wind resistance; it also dramatically reduces the centre of gravity, meaning that, if a rider was to take a spin, there would not be far to fall off. The deep bucket seat also minimises the risk of anyone falling out of the kart. The engine cut-off switch is located on the steering wheel and is therefore accessible quickly and easily. The Maxx Drift also features other safety fitments including metal fuel tank, an air filter and carburettor cover, chain guard and a metal exhaust cover. As with all of our four wheeled products, the throttle is restrictable by just turning a screw, thereby allowing the speed of the kart to be restricted according to the rider's proficiency. Once confidence has grown, the throttle can be de-restricted to allow users to access the full potential of the superb engine. The Maxx Drift has been given its name for good reason: increasing the throttle when locked in a tight corner will allow riders to execute controlled power slides, literally allowing you to precision 'drift' around those tricky corners with ease. Chunky off road tyres deliver the grip that is needed for riding on dirt, grass, gravel or tarmac. Whether you are looking for light hearted fun or for serious racing at the track, the Kazuma Maxx Drift Gokart presents itself as being the perfect choice for both adults and older juniors. Sporty, versatile, safety conscious and fun, the Max Drift 200cc go kart will not leave you disappointed. Great low down torque - 6.5hp! Warranty is 3 months parts and labour / return to base.